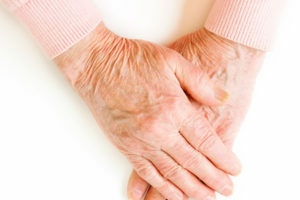 As we grow older, our skin can gradually become more loose and flaccid. 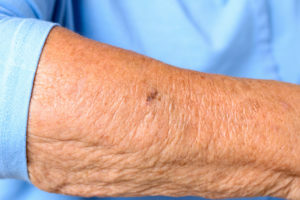 But when skin begins to feel thin as paper, or like crepe, the most common cause isn’t age, says dermatologist Amy Kassouf, MD. Unlike wrinkles around the eyes and mouth (that result from repeated muscle movements), crepey skin typically can be traced to sun damage. Over time, exposure to the sun breaks down elastin, the fibers in your skin that allow it to stretch and return to its normal position. Those fibers can heal, but they eventually lose their ability to repair completely after repeated exposure over time. Think of it as an elastic waistband that, with wear, becomes more lax. Crepey skin usually begins to appear when you’re in your 40s. But it can show up as early as your 20s if you are a chronic tanning-bed user or have gained and lost substantial amounts of weight. Medications are another potential cause of crepey skin, such as long-term prednisone. Luckily, there are ways to prevent crepey skin — and even correct some aspects of it, Dr. Kassouf says. Skin loses elasticity as we age because of dehydration and other factors. There’s no way to completely avoid crepey skin, but there are a few ways to delay it. Stick to the shade. 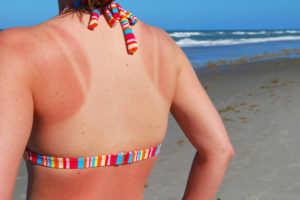 The most important thing to do, says Dr. Kassouf is to stay out of the sun as much as possible. Also, protect your skin when you’re in the sun. Make skin hydration a priority. Keeping skin well-hydrated with a good moisturizer helps prevent injury that creates or worsens crepiness. Pay attention to ingredients. Make sure your moisturizer contains alpha or beta hydroxy acids, such as salicylic acid, lactic acid or glycolic acid. These products lubricate and plump the skin, helping reduce that crepey appearance, Dr. Kassouf says. If you’re into your 40s or beyond, your skin no longer produces oils the way it did when you were younger. These oils act as a barrier, protecting skin from chemicals in the environment that cause irritation and inflammation. Adding emollients and hydroxy acid cleansers to your skin care routine not only helps keep your skin from becoming crepey, but it also helps prevent further damage if your skin is already lax. Dr. Kassouf recommends retinol topical creams to help reduce that crepey look. Retinols help restore skin’s elasticity and thicken collagen (which gives our skin its structure) as well as elastin (which gives our skin its stretch). What about plastic surgery or other options? Moisturizers and other creams work well for mildly crepey skin, but they have limitations. For instance, if you’ve lost a large amount of weight, leaving you with a lot of crepey skin, a plastic surgeon likely will need to remove it. Before deciding on surgery, you may want to consider procedures like Thermage, which uses radio frequency waves to heat skin, build collagen and tighten up in a limited area. This procedure is sometimes painful and costly, and there are slight risks, Dr. Kassouf says. It has variable success rates and isn’t meant for everyone, she says. There are a host of options available — from lotions to surgery — that can help reduce crepey skin as you age. Some products are available over the counter and some need a prescription. Work with your doctor or dermatologist to decide what the best options are for your lifestyle and skin care needs. Can Any Treatments Firm Up My Crepey Skin?